OAKLAND, CA FEBRUARY 1, 2011 – Shaffer-Motorsports racing team will join Class 10 for the Best In The Desert series, the SNORE Mint 400 and the SCORE Baja 1000 in 2011. Torchmate number 1066 Driver of Record Mike Shaffer boasts 3 Baja 1000 wins, 3 SCORE Championships and one BITD Championship in Class 1700. “We are really excited to move into Class 10 this year and be competitive. This car is really fast, and it will be fun to race,” said Mike Shaffer. “BFGoodrich was actually a huge supporter of us moving to Class 10,” said Shaffer who will run 33×10.5 Baja TA tires. We are also excited to have Rigid Industries on the team with solid and continued support from Torchmate, PSC Steering, RuffStuff Specialties, Shaffer’s Offroad and Pirate4x4. The team will be composed of Mike Shaffer of Shaffer Offroad with co-driver Orlando “Bondo” Giannecchini of Any Seven Offroad. Driver Shawn Twitchell and son Ian Twitchell co-driving will split most race efforts. On the bigger races, including BITD Vegas to Reno and the SCORE Baja 1000, Daniel Aeberli will fly in from Switzerland to be a third driver with co-driver Bernie Strom. The Full Potential Motorsports built car is just over a year old and has been driven very successfully by Kevin Ellis #1006. “This car actually has a lot of history to it,” said Shaffer. 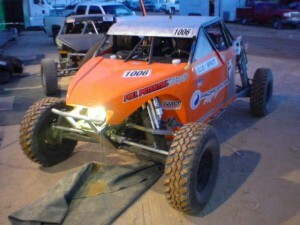 “It was the first Class 10 car with a 2.4 EcoTech motor to race BITD which was the start to EcoTechs in the class.” The car will now be prepped at Shaffer’s Offroad in Oakland, CA. BITD Parker 425 will be the debut appearance for the team this weekend. “We will be taking delivery of the car on the way to Parker,” chuckled Shaffer. “We won’t have had any seat time, but #1066 will be there.” Shawn Twitchell and son Ian Twitchell will start the race, and Shaffer and Giannecchini will take the finish line. They will compete in Parker and then return to Shaffer’s Offroad for paint and graphics before the Mint 400. More about Mike Shaffer: Mike Shaffer is the owner of Shaffer’s Offroad that helps customers build the vehicle of their choice, from bolt on accessories to custom one off vehicles. Shaffer has been racing for 27 years, starting with BMX and then age 16 in drag racing and his first desert race was fourteen years ago. Shaffer was driver of record for 3 Baja 1000 wins, 3 SCORE Championships and one BITD Championship in Class 1700, along with rock crawling National Championship and ARCA Championship. More about Shawn Twitchell: Shawn Twitchell started desert racing motorcycles in 1972, went to drag racing in the 1980’s, circle track in the 1990’s and is now back in the desert driving with Shaffer Motorsports. He has been a member of Shaffer Motorsports team since 2008 helping win three SCORE 1700 Championships. Twitchell is the Business Unit Manager for FMC Technologies’ Technisys Group and has been married for 30 years to Vickie. Desert racing is in their family encompassing four generations including his son Ian, who will co-drive for Shawn. Two of seven grandkids are already earning their stripes in the pits and at the shop. More about Daniel Aeberli: Daniel Aeberli is the CTO of Meditron, a Swiss medical distribution company that he co-founded 20 years ago in Switzerland. He raced with the Shaffer Motorsport team in 2010 helping them win SCORE Primm in Class 1700. Aeberli drove the first section of the 2010 SCORE Baja 1000 and is looking forward to coming back to the United States to race in BITD including Vegas to Reno and SCORE Baja 1000. Active in many sports, he especially enjoys skiing and hangliding in Switzerland.